Ideally located place for your holidays in Andalusia, you can visit Sevilla, the Alhambra, Ronda or Malaga and enjoy our home. Very peaceful place, choice furniture, recent building, real countryside, all facilities, air conditioning, large terrace, BBQ, large Private suimming pool 8x6 m, solarium with rustic umbrella chaiselong, near golf, Marbella beaches to 20 minutes driving away, plot fenced 5000 m2, lots gardens and flowers and trees. From Casa VILLALOBOS you can visit: Marbella (25 min), Malaga (35min) Picasso Museum, Ronda (1 h.) "Bull Ring" an Historic Center, Mijas, Costa del Sol, Granada (2 h.) ski for winter and La Alhambra, Seville (3 h.) Córdoba (2,5 h), Gibraltar, and all little white villages of Guadalhorce Valley (Tolox, Monda, Alozaina, Guaro,Ardales, Casarabonela) and Sierra de Las Nieves (Natural Parq Biosphere Reserve for UNESCO). Also, in Villa Pereila "Oranges free during the season to eat or to do natural orange juice". We stayed here for two weeks in September 18. Guillermos was very accomodating when we had to change our holiday dates at short notice. The villa is spotless, very well equiped along with a great barbecue area,swimming pool, and a huge orchard to help yourself from. Ideal location for visits to Ronda,Mijas,Marbella without having to spend hours in the car. Less than 10 minutes to supermarkets like Liddle,Aldi and Mercadona. Wouldn't hesitate in recommending it anyone. Thankyou to Guillermos and his mum who filled the fridge with oranges for us on arrival,they were delicious. Great place for family vacation with huge garden with fresh oranges, nice pool, basket ball area and playground for the kids. Practical with a big table in the shadow outside so we could have all meals outside. Nice inside as well, but a small minus that most of the closets were locked by the owner. We hebben een super leuke vakantie gehad in Villalobos .Het is een prachtig huis en super schoon ,de eigenaar is heel aardig en behulpzaam.Van alle gemakken voorzien. In het dorpje Coin kun je heerlijk eten voor een zacht prijsje in diversen restaurantjes . De Mercadona en Lidel supermarkten zijn op 5 min rijden . Wonderfully private villa with a crystal clear swimming pool, set within immaculate grounds. The villa itself is on one level and is cosy, clean and extremely comfortable. Guillermo allowed us to check in early and check out late without any charge for the extra time (thank you!). Guillermo's mum welcomed us into the home and showed us around, then came back later to return our deposit when we were leaving. She was a lovely host and despite the language barrier, made sure we had everything we needed before she left . 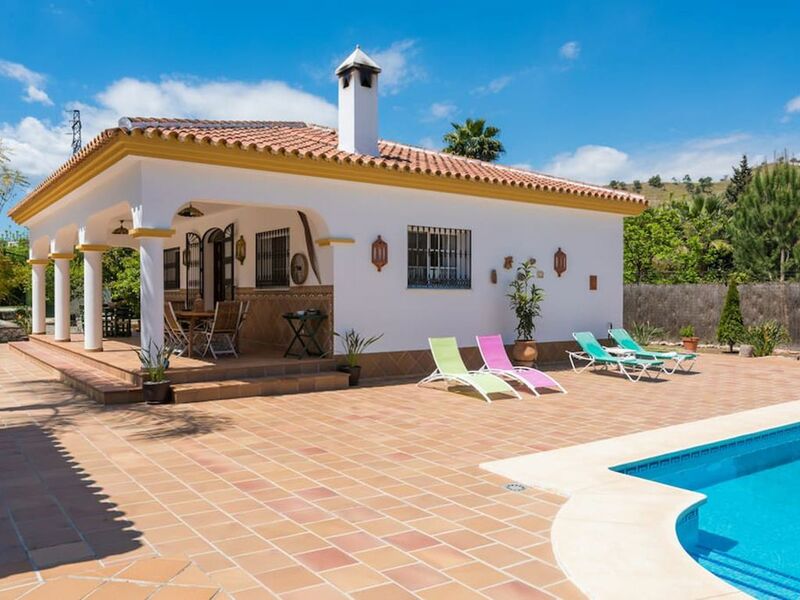 The villa is in a rural location, so you'll need a car, but it's only five minutes' drive to Coin where there are three supermarkets (closed on Sunday), and a selection of bars and restaurants. We wouldn't hesitate to recommend Guillermo's villa to future guests. The only thing you might miss is an oven - there's a full gas hob but no actual stove, so shop wisely! "Everything was very nice. Great thanks to the owners for warm reception and especially for the possibility of our late-late coming. The orange trees with oranges are perfect. Fresh orange juice is the most beautiful I have ever drunk. The description of the villa is fully completed and correct. No disappointments at all. The neighbor is very close to the villa. So, when the guests were staying at the neighbor’s villa it was a little bit noisy. "vast territory + great house with all the necessary + good location = succesful holidays"
In the road to Malaga from the Airport for the railway to follow the direction to Cártama A-357, on having come to take the highway up to Coín A-355. We send a map to come to the house. Crafts of ceramics. Recommended visits: Marbella, Ronda, Ardales (El Chorro), Mijas, Málaga, Tolox, Casarabonela, Alozaina, Yunquera, etc... Restaurants nearby, Local cuisine, there is visitors book where we can find very suggestion about local places to visit,restaurants, shoppings and the experience of another clients. Fianza pedida, arras/deposito de reserva, entrega de llaves realizada por propietario, propietario ausente durante la estancia.